For decades startups were managed by pretending the company would follow a predictable path (revenue plan, scale, etc.) and being continually surprised when it didn’t. That’s the definition of insanity. Luckily most startups now realize there is a better way. As we described in previous posts, startups fail on the day they’re founded if they are organized and managed like they are a small version of a large company. In an existing company with existing customers you 1) understand the customers problem and 2) since you do, you can specify the entire feature set on day one. But startups aren’t large companies, but for decades VC’s insisted that startups organize and plan like they were. 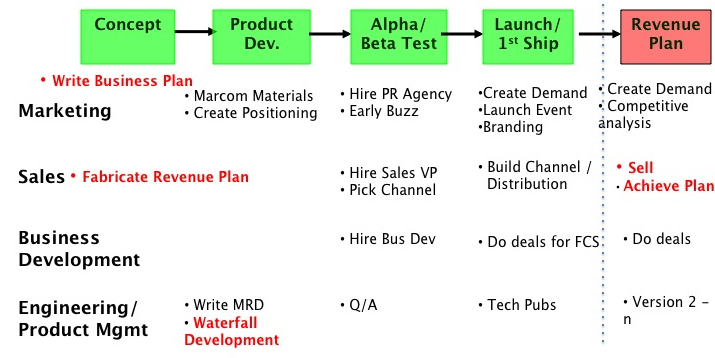 These false assumptions – that you know the customer problem and product features – led startups to organize their product introduction process like the diagram below – essentially identical to the product management process of a large company. In fact, for decades if you drew this diagram on day one of a startup VC’s would nod sagely and everyone would get to work heading to first customer ship. 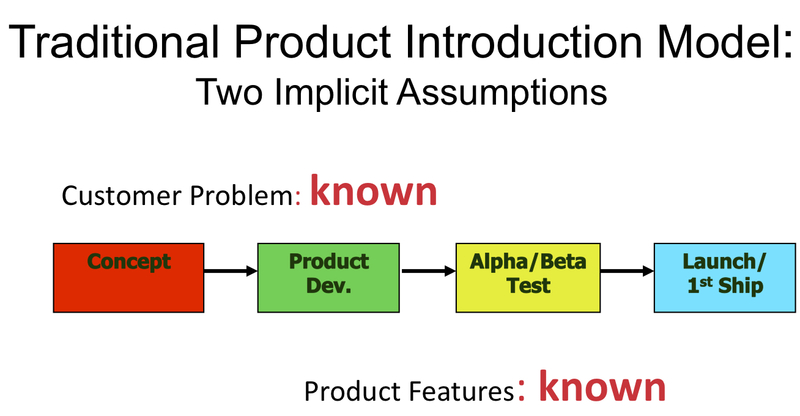 Notice that the traditional product introduction model leads to a product launch and the execution of a revenue plan. The revenue numbers and revenue model came from a startups original Business Plan. A business plan has a set of assumptions (who’s the customer, what’s the price, what’s the channel, what are the product features that matter, etc.) that make up a business model. All of these initial assumptions must be right for the revenue plan to be correct. Yet by first customer ship most of the business model hasn’t been validated or tested. Yet startups following the traditional product introduction model are organized to execute the business plan as if it were fact. Unless you were incredibly lucky most of your assumptions are wrong. What happens next is painful, predictable, avoidable, yet built into to every startup business plan. Trying to execute a startup revenue plan is why crises unfold in a stylized, predicable ritual after first customer ship. Now the company is in crisis mode because the rest of the organization (product development, marketing, etc.) has based its headcount and expenses on the business plan, expecting Sales to make its numbers. Without the revenue to match its expenses, the company is in now danger of running out of money. Surprisingly we have never explicitly articulated or understood that what’s really happening when we hire a new VP or CEO in a startup is that the newly hired executive is implicitly pivoting (radically changing) some portion of the business model. We were changing the business model when we changed executives. Startups were pivoting by crisis and firing executives. Yikes. The alternative to the traditional product introduction process is the Business Model Design and Customer Development Stack. It assumes the purpose of a startup is the search for a business model (not execution.) 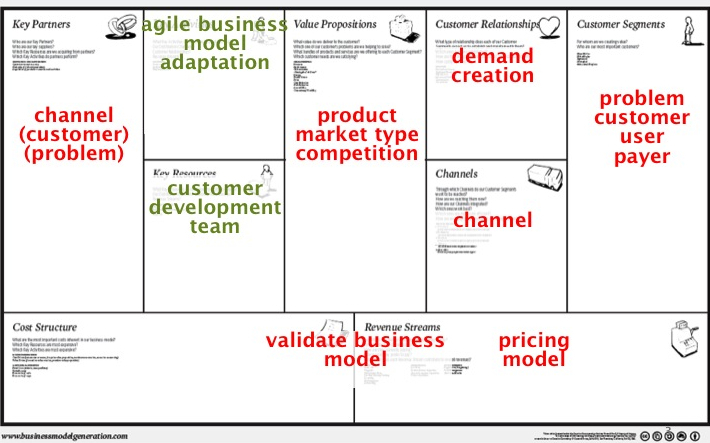 This approach has a startup drawing their initial business model hypotheses on the Business Model Canvas. Each of the 9 business model building blocks has a set of hypotheses that need to be tested. The Customer Development process is then used to test each of the 9 building blocks of the business model. 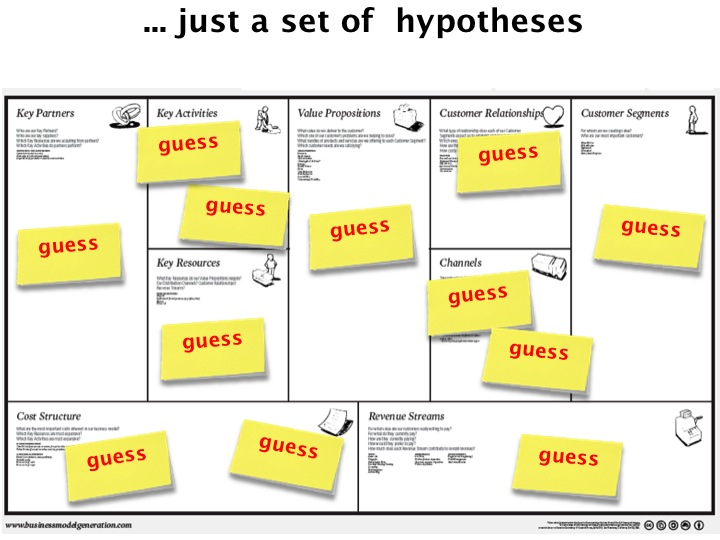 Each block in the business model canvas maps to hypotheses in the Customer Discovery and Validation steps of Customer Development. Simultaneously the engineering team is using an Agile Development methodology to iteratively and incrementally build the Minimum Feature Set to test the product or service that make up the Value Proposition. If we accept that startups are engaged in the search for a business model, we recognize that radical shifts in a startups business model are the norm, rather than the exception. This means that instead of firing an executive every time we discover a faulty hypothesis, we expect it as a normal course of business. Why it’s not a crisis is that the Customer Development process says, “do not staff and hire like you are executing. Instead keep the burn rate low during Customer Discovery and Validation while you are searching for a business model.” This low burn rate allows you to take several swings at the bat (or shots on the goal, depending on your country.) 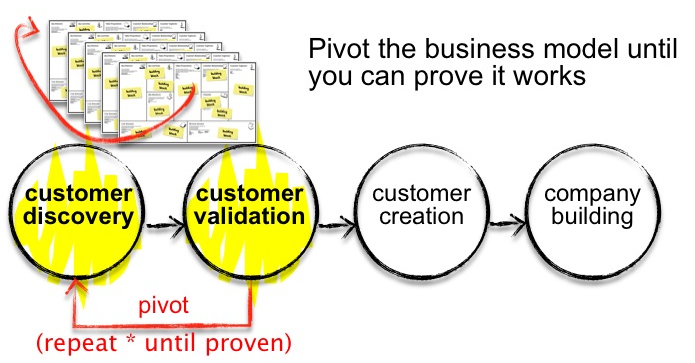 Each pivot gets you smarter but doesn’t put you out of business. And when you finally find a scalable and repeatable model, you exit Customer Validation, pour on the cash and scale the company. These hypotheses lead to a revenue plan that is untested, yet becomes the plan of record. Revenue shortfalls are the norm in a startup yet they create a crisis. The traditional solution to a startup crisis is to remove executives. Their replacements implicitly iterate the business model. The alternative to firing and crises is the Business Model/Customer Development process. We keep the burn rate low while we search and pivot allowing for multiple iterations of the business model.